Only thing that makes this OP is that it's common. Almost guaranteed to get one in arena deck. THIS CARD IS BROKEN AF. 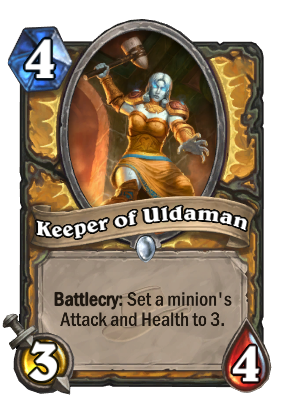 Actually, along with those other paladin cards that you cant remove them immediately if you didnt mulligan like sucking gods d*ck Keeper of Uldaman is incredibly overpowered. Paladin already have buff and debuff cards like Aldor Peacekeeper and Blessing of Kings and such and this is way way way too much. There is not even a counter of it. You cant protect your Ysera or Ragnaros from getting demolished by Uldaman. You cant play around of it unless YOU are playing it. I am having a serious cracking up here. Send help. Jesus damn it Blizzard what the actual f**k OMG. That doesnt matter since it's an adventure card. Completely over powered in Arena. Can't wait for the drafting bonus on LOE to go away. This Card really belongs into the BS category. With keeper of uldaman and aldor peacekeeper Paladin has two minions with OK stats for their Price, which make it impossible to Play big minions against Paladin. You just played Ysera on turn 9? Well tough luck, there is no Chance it will live for another turn. The Card might even have been ok if it could only be used on big enemy minions (like BGH) but the flexibility to transform (and sometimes buff) your own minions as well make it way to flexible though the entire game. Such a huge annoyance in arena. Thanks to this card, it's pretty much never a good idea to drop a nice fat minion like a boulder fist or kraken on cure anymore. It just gets shrunk. If the other guy has a similar board compared to you, and you spend the turn playing a big minion (which is usually a good play), you basically lose the game. Meanwhile, paladin gets to drop it's fat dude hassle free. This card, along with some of the other cards released in LOE are the primary reason why people now draft incredibly aggressive curves, resulting in games being decided as early as turn 1.
sap is even worse. sap is like 2 mana win the game in those situations. Paladins always get the best stuff. And it's always common too! ok I forgot about arena when I made this comment. you all are right. and this card is even more op in arena than constructed. Nice turn 3 Deathlord you got there. Watch Shaman get a dominant 4-drop next expansion like Tuskarr Keeper or something, but then Paladin will get like a 1-cost 1/2 minion with divine shield "Shielded Tinybot" or something. I love this card. Been running 2 in a secret-less aggro pally deck. This card is awesome against anything big, when you have some board. It lets your 3-attack minions on board kill giants. It also works with truesilver or that 3-damage 4-mana cantrip reactively. This card is potentially +2/+2 buff and 3/4 body, that means 5/6 statline on 4-mana card. Keep in mind that this card isn't meant to be played t4 on empty board, so prepare to have more t4 cards(gladly, paladin has lots of them). It can be played standalone t6 with hero power, generating 3/3 + 3/4 (6/7 total, best stat for that mana). What's the paladin Dr. 5?